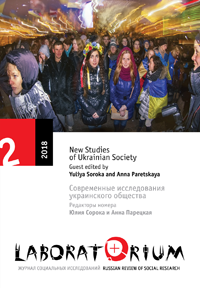 The 2013–2014 political protests and subsequent transformations of Ukraine’s political landscape, as well as the annexation of Crimea and military actions in the eastern part of the country, significantly changed Ukrainian society and also revealed new social phenomena and processes, thereby suggesting new topics and directions for social research of Ukraine for scholars both inside the country and abroad. During this period the themes of political crisis, revolution, war, refugees and internal migration, social media and mobilization, information warfare, and memory policy were added to the more traditional Ukrainian studies topics of collective and cultural memory, national identity, borders and borderlands, ethnonationalism, regionalism, and such. Soroka, Yuliya, and Anna Paretskaya. 2018. “New Studies of Ukrainian Society”. Laboratorium: Russian Review of Social Research 10 (2), 5-8. http://www.soclabo.org/index.php/laboratorium/article/view/819.